XLRI - Xavier School of Management, one of India’s premier B-Schools in collaboration withInternational Labour Organization - Bureau for Workers’ Activities (ACTRAV) organized the first ever seminar on“Labour Law and Governance Reforms and Labour Rights in India in the Era of Globalization” on 29thSeptember, 2014. The seminar witnessed Trade Union Representatives, Representatives from ILO, Academicians and students debate and discuss upon diverse perspectives related to labour issues and rights. The seminar marked a first of its kind association between two very well established bodies, namely XLRI and ILO and also brought together Central trade union leaders from the INTUC (Indian National Trade Union Congress), BMS (Bhartaya Majdoor Sangh), CITU, HMS and AITUC to the same platform. Some of the eminent guests at the seminar were Mr. Raghwan, Asia Pacific Desk Officer, ILO ACTRAV, Bureau for Workers’ Activities, Geneva; Professor Dev Nathan, the Institute for Human Development, New Delhi; Dr. Pravin Sinha, Indian Industrial Relations Associations; Professor Praveen Kumar Jha from Centre for Informal Ssector & Labour, Jawaharlal Nehru University, New Delhi; Trade Union representatives, Mr. Chandrashekhar Prakash Singh and Mr. Shyam Sundar Sharma; Ms. Ramapriya Gopalkrishnan advocate from Madras and an ILO Consultant Madras High Court, Ms. Christine Nathan, a former ILO ACTRAV official and currently an ILO Consultant. The seminar was inaugurated by Fr. E Abraham, Director of XLRI, and Dr Pranabesh Ray, Dean (Academics) at XLRI and Prof. K. R. Shyam Sundar, Professor, HRM Area, XLRI along with the other guests. At the event, both the Director and Dean addressed the topic of labour law reforms and its relevance pertinence in the current context, while Prof. K. R. Shyam Sundar, used data and statistics to question the relevance and legitimacy of the labour law and governance reforms. The Trade union representatives across party affiliations threw light upon the dismal state of labour in the largest democracy of the world. “The working people throughout the country are going to face a severe onslaught on their rights and livelihood in the days to come from the corporate-servile polity in power at the Centre. Already, such a move is reported to be afoot in respect of a number of labour laws,” they commented. The other speakers too went on to speak about how labour can no longer be treated as a mere commodity but as an equal stakeholder in organizations and criticised the ongoing labour law and governance reforms in India. Prof. Praveen Jha said that amendments in the Factories Act propose to increase the threshold limit of employment for factories operating without power from 20 to 40 and from 10 to 20 for factories operating with power. Complaints against the employer about violation of this Act would not receive cognizance by a court without prior written permission from the state government. Prof. K. R. Shyam Sundar, Professor, HRM Area, XLRI and the convener commented on the event, “The issue of labour rights in the era of globalization has become a huge area of concern in the current context. 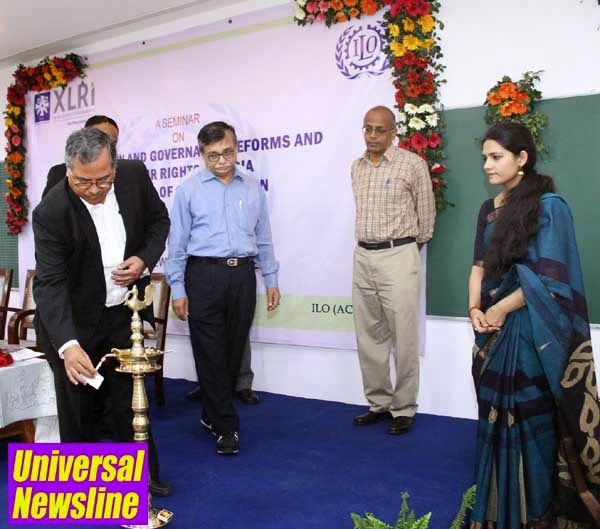 The 1st-ever seminar on labour law reforms and labour rights by XLRI is a timely event as some state governments and the central government have either passed or proposed a few critical labour law reform measures which will have significant implications for both employers and the workers. The seminar will bring out diverse perspectives on not only the topical theme of labour law reforms but the basic issues concerning labour rights”. “ILO being a unique tripartite-ly structured United Nations Body and a universally recognized competent and legitimate global organization to deal with labour standards and regulations is keeping a close track on the developments concerning the labour law reform proposals in India. The involvement of ILO's Bureau for Workers’ Activities (ACTRAV) is truly significant. It also heralds a possibility of a long-term productive interface between the ILO and XLRI, which would be mutually beneficial and reinforcing. Most importantly, the seminar affords a valuable opportunity for future business leaders in XLRI to be sensitized on crucial contemporary workplace-centric issues as well as important matters concerning labour rights. ," Prof. Shyam Sundar added.